The women’s liberation movement once taught ladies to cast off their bras in solidarity and empowerment; now a new startup, founded by two women, is inverting that formula to make sure that when you put it back on, that bra fits like a glove. The company is playing on the idea of a modern woman, who may love to shop, but either doesn’t have the time or doesn’t like the selection or experience shopping closest to where she lives. That woman is likely to already be experienced in buying things online so is already semi-initiated. True&Co began when two friends, Michelle Lam and Aarthi Ramamurthy, met over coffee and found themselves complaining about buying bras, and — as you might expect from people who had worked at companies like companies like Bain Capital (scaling operations for companies like RentTheRunway), and Microsoft — that progressed into inspiration for a new startup. Lam is now the CEO and Ramamurthy is head of product. True&Co is one of those companies, in the tradition of Warby Parker, that takes a product one would think would be impossible to sell well online, and just figures out how to do it well. In this case, Lam and Ramamurthy studied how bras are measured and then mapped that into a computer algorithm that processes some 2,000 different body variations. The end result for users is a quick and easy questionaire (a sample Q in screenshot below) that leads a woman through a list of essential information (what shape are your breasts, what style do you most like, what size do you wear now, what don’t you like about your bras today, have you gained or lost weight recently, etc.). The site then produces a range of bras from a bunch of popular name brands from which to choose, priced at $45 each. 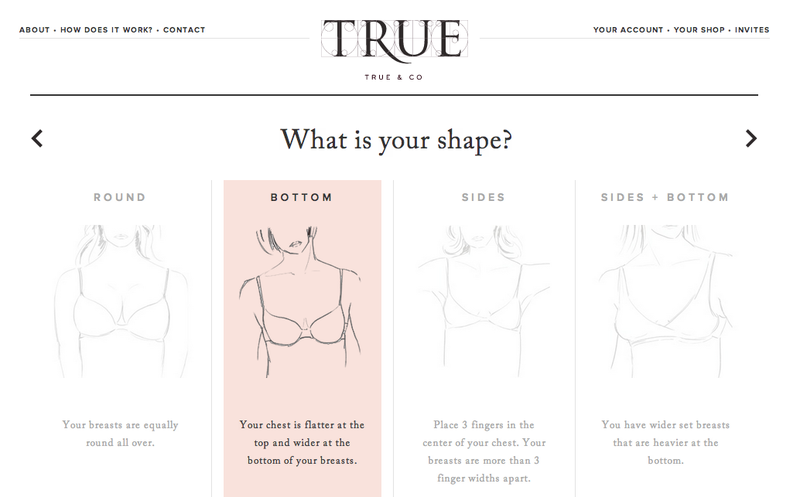 Like Warby Parker, True&Co plays a bet-spreading hand and sends you five bras in one go: a user picks three, and True&Co pick two (or all of them if you are feeling especially trusting). You only pay for those you keep. In trials, Lam says women were reporting that on average three out of five bras fit well. True&Co is launching with 20 name-brands, but, again like Warby Parker, they may move into some original design down the line to help bring down costs. “Our fit data provides us and our brand partners with valuable insight into the design of bras,” says Lam. “So stay tuned for more interesting news from us going forward.” Future products will also include a bigger range of undergarments, including matching underwear and other lingerie. Lam says that True& Co will be using the investment to expand existing staff, help with the launch and continue with business development.